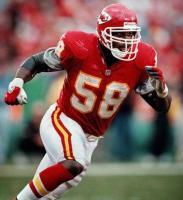 On January 23, 2000, Derrick Thomas slipped off the road on 435 in Kansas City while on his way to the airport. There was a bad snowstorm that night and reports said that Thomas was speeding and weaving in and out of traffic. Derrick Thomas and one other passenger were not wearing their seatbelts and were thrown from the vehicle, and a third passenger who was wearing a seatbelt walked away from the accident without injury. The second passenger was pronounced dead at the scene, and Thomas suffered injuries that paralyzed him from the waist down. Derrick Thomas was transferred to a hospital in Miami where he was appearing to make a speedy and miraculous recovery, even walking on his own down the hallway and telling his head coach that he would be coming back to play. But one morning Thomas developed a pulmoary embolism in his paralyzed legs that travelled into his lungs. This blood clot that travelled to his lungs caused Derrick Thomas to go into cardio-respiratory arrest and he passed away instantly. Derrick Thomas was posthumously inducted into the NFL Hall of Fame on August 9th, 2009 - 9 years after his untimely death. Kansas City 1 Stop - All Content Copyright 2011 by American Entertainment Solutions, LLC.